When they came to Capernaum, those who collected the two-drachma tax came to Peter and said, “Does your teacher not pay the two-drachma tax?” 25 He said, “Yes.” And when he came into the house, Jesus spoke to him first, saying, “What do you think, Simon? From whom do the kings of the earth collect customs or poll-tax, from their sons or from strangers?” 26 When Peter said, “From strangers,” Jesus said to him, “Then the sons are exempt. 27 “However, so that we do not offend them, go to the sea and throw in a hook, and take the first fish that comes up; and when you open its mouth, you will find a shekel. Take that and give it to them for you and Me.” (Matt. 17:24-27). In a very real sense, Jesus was uniquely the Son of God; His Father was/is the owner of the universe. A case could be made that as such, Jesus was exempt from paying the temple tax, a half shekel, an annual tax paid by every male Israelite. But to avoid causing an occasion of offense, Jesus paid the tax. Peter would never forget the day that he went to the sea (Sea of Galilee) and pulled in the fish that had a shekel in its mouth, payment for two. 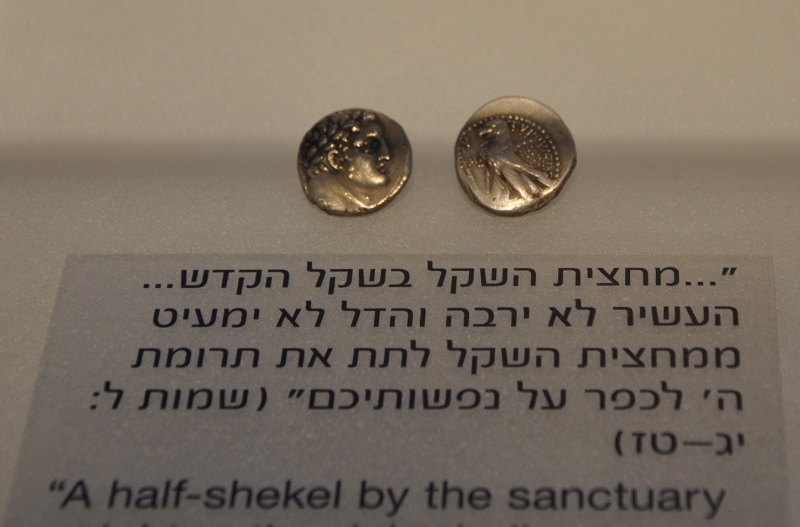 I had the opportunity to photograph the temple tax in the Israel Museum a few weeks ago. Half Shekel. Israel Museum. Photo by Leon Mauldin. Every Jewish male over the age of twenty was obligated to pay a yearly tax to the temple. The Tyrian half-shekel silver coin was used for this purpose. The funds raised were used for maintenance, the purchase of sacrifices, and, indirectly, as a means of conducting a census. Because Tyrian coins were not particularly common, they needed to be purchased from money-changers in the Temple. The coin depicts the Tyrian god Hercules-Melqart on one side and an eagle standing on the bow of a boat on the other. It is our desire that such photos and info help illuminate our reading of Scripture. This entry was posted on Wednesday, November 13th, 2013 at 10:39 PM and is filed under Bible History and Geography, Bible Study, Israel, New Testament, photography, Travel. You can follow any responses to this entry through the RSS 2.0 feed. You can leave a response, or trackback from your own site. This text might demonstrate that only Jesus and Peter were over 20. We see paintings of older long-bearded disciples but being a teenager would be more consistent with the age of becoming a disciple in this era. Thanks for writing. The only scriptural reference to Jesus age would be Lk. 3:23; “Jesus, when he began his ministry, was about thirty years of age (ESV). Additionally we have the statement of some of His opponents: “So the Jews said to him, ‘You are not yet fifty years old, and have you seen Abraham? '” (John 8:57, ESV). I wonder why the ruling class has used the eagle as a symbol of their power for many generations, as shown on the old coin in your photo. The flag of Egypt today has an eagle on it, the Nazis used the eagle as a symbol, the US military uses the eagle symbol and the Federal Reserve prints an image of the eagle on their money. The eagle is an amazing creature, but not everyone that uses its image is God fearing. It’s interesting that even the secular world and unbelievers choose the eagle as a symbol, but why do unbelievers like this symbol so much? And the first beast was like a lion, and the second beast like a calf, and the third beast had a face as a man, and the fourth beast was like a flying eagle. And the four beasts had each of them six wings about him; and they were full of eyes within: and they rest not day and night, saying, Holy, holy, holy, Lord God Almighty, which was, and is, and is to come. Maybe the rulers use the eagle as a public symbol because unconsciously, people know it is a good symbol, and people feel attracted to the symbol and support whatever has the symbol on it, as they should support the Lord Jesus Christ but do not, as the Germans supported the Nazi government with propaganda, patriotism and pride, while being led through the torments of World War II because they were following man instead of following God.